Over the past 10 years God has been gracious to us by allowing us to live and work at Restoration Gateway in Uganda, East Africa. His blessings have poured out upon us and RG as you have prayed, volunteered, and given of yourselves so generously. As you have given to Him He has been faithful to make Himself known not only among those at Restoration Gateway, but also throughout the country of Uganda and many other places on the earth. Many have heard the Good News of Jesus and responded positively to it; 120 children and 10 babies have been given loving homes and education; and hundreds of Ugandans have been given work that provides for their families through your sacrifice. Many thanks for your support as you pray and consider how you can continue to be involved in God’s work by praying, going, and giving now and in the future. Returning Head Teacher, Mr. Godfrey Opio, was given the additional title of Head of Education, putting him in charge of both primary and secondary schools. Major change in employment: In construction, brickmaking, and agriculture, RG has moved to contracting work rather than salaried employees. We are working toward making all, except senior staff and teachers, contract workers. In agriculture we have Mr. Emmanuel Olanyo as head and Mr. Patrick Tia as assistant. Mr. Olanyo has completed 8 parts of his 10-part Aqua Management course from Auburn University in Alabama as he fulfills his duties in agriculture. We presently have eleven security officers with a new head, Mr. Justin Steelwire. Mr. Steelwire is an officer in the UPDF and is stationed at the Karuma barracks. Our longtime friend and head of security, Mr. Francis Dawoka, died in May of this year. Mr. Jasper Opio remains as head of dental services at RG. We have had four medical officers come and go this year for various reasons – 2 for further education, one to start his own clinic, and one for unexplained reasons. The newest one came after our recent return to the USA, and we do not know his name. 2 nurses aides, 1 dental aide, 1 healthcare cashier, and one cleaner, along with the newly hired medical officer, make up the present healthcare staff. The pharmacist left since our return to the USA. A new 15-month intern, Allison Conder, has taken on the role of volunteer coordination and director of hospitality. Several new roads have been built at RG, and old roads have been repaired and covered with muram. The outside road is better, but still needs work which we have discussed with the Sino-hydro officials and those at district government. No vehicles got stuck on the roads this rainy season except those that chose to drive in the ditch. All orphan home bathrooms were tiled and repaired—a total of 42 bathrooms as well as the school’s bathrooms. Windows and doors in the orphan homes that are rotted have been or are being replaced with metal frames and new mosquito screens, as needed. Most machines, vehicles, and generators have been put in working order, and the maintenance schedules are generally being followed. 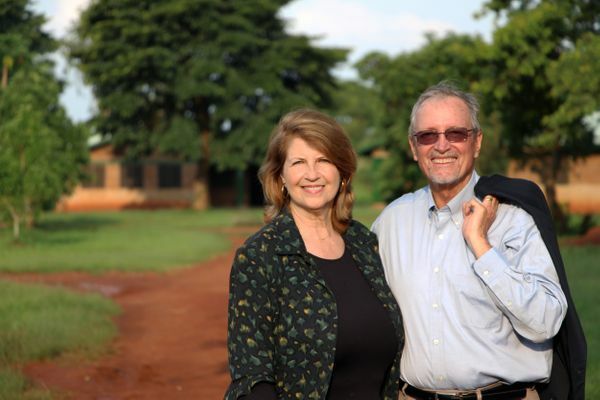 Two new water pumps ($2,500 each) have been purchased, and one non-functioning pump will be pulled and replaced on the McCalls’ return to Uganda. The other pump will be kept as a backup or used in the next well drilled. A new grinding mill building has been built and the grinding mill machine set up to grind corn for the children’s posho (corn porridge) and to make layers mash for the chickens. There are now 120 children and 10 babies with 16 moms. While we have had an increase in malaria in our children this season and in the general population, all of the RG children are well-nourished and in very good health. Their education is going on well. They all received medical and dental exams twice this year. They have all received new mosquito nets, been maintained in good clothes and shoes, and have received their needed school supplies. The children’s nutrition has been far above Ugandan standards. Presently, Nzinga, a trained social worker/counselor is interviewing and working with the children, along with other trained counselors coming this summer. 15 children took the Primary Leaving Exam, and results will be available in January 2017. All 15 7th graders advanced to the 8th grade this year, becoming our first Secondary School class. Our children won a number of district sporting events this year. Team house with 6 large bedrooms, 4 baths, kitchen, dining room, and large veranda with Nile River view. House has hot water, tiled floors, refrigerator, stove and oven, and fans in rooms. Capacity for 46 persons. RG had about 250 volunteers this summer and many others throughout the year. We had consultations from Project CURE and ITEC. We had a faculty member from LeTourneau University visit RG in an effort to establish a relationship between the university and RG. We have visited with faculty at Baylor University, Union University, Mississippi State University, and talked with faculty at Auburn University. Many exciting meetings and events are set for the remainder of 2016 and beginning of 2017.